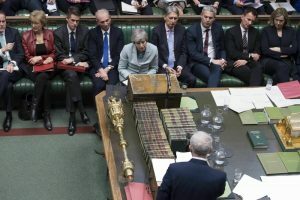 They set up a series of votes that could dramatically alter the course of Britain's departure from the European Union. But it also conceded that the new votes might be a way to break the monthslong Brexit gridlock. May said she would “engage constructively” with the results of the process, though she said she was skeptical that it would produce a decisive result. However, the EU granted a shorter delay than May sought. It said if Parliament approves the proposed divorce deal, the U.K. would leave the EU on May 22. If not, the government has until April 12 to tell the 27 remaining EU countries what it plans to do – leave without a deal, cancel Brexit or chart a path to a new option. The EU said its members would be able to cope with a no-deal departure, although more remained to be done on ensuring an open border between EU member Ireland and the U.K.’s Northern Ireland – something both sides have agreed to. Checkpoints there were a source of tension and a target during the decades of sectarian violence before Northern Ireland’s 1998 peace accord. At a meeting Sunday at the prime minister’s country retreat, Chequers, prominent Brexiteers told May they might back the deal – if she agreed to step down so a new leader could take charge of the next phase of negotiations, which will settle Britain’s future relations with the EU. She told lawmakers that Britain would not leave the EU without a deal unless Parliament – which has already rejected the idea – voted for it.